The trees of the mangrove swamp began to form a 'V' ahead of the party, blocking their path forward and herding them back towards the perimeter wall. Duckweed and roots began to spout up between the trees making passage even more difficult. 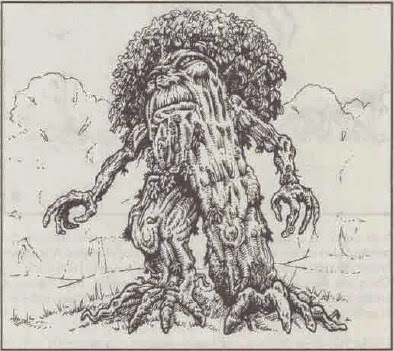 An ancient gnarled treant (known as a Gakarak) emerged from a nearby tree and demanded the 'sticking meatsacks' left its home, not wanting 'more intruders like the others'. The party paddled/few back a ways and discussed how to get around the blockade; they decided retreat wasn't an option and so planned a way to deal with the treants. When it reappeared nearby, there was a flurry of fireballs and flame strikes that drove it into a retreat and allowed the party to press on. A few hours later, the party came to an island in the midst of the swamp. In the midst of the overgrown island sat a jade green building in the shape of a large frog, with two multi-faceted red eyes and an open mouth. Two stone walls enclosed an overgrown garden that led up to a gatehouse and courtyard around the base of the building. At the entrance to the garden, were two wooden jetties leading out to the swamp, with the bones of eels and crocodiles scattered in the water underneath. Beyond this, there were signed a other small jetties and buildings, a small settlement long since swallowed by the thick jungle. Mendel and Faldak lead the party out onto the quays, which strangely quivered as they landed, and held them fast. Two mimics that were pretending to be the jetties, came to life and tried to grapple the warriors. With some frantic chopping and further magical fire, the two ooze-like impressionists were defeated, but the noise of the battle had drawn the attention of the gakarak which emerged from the trees and called upon more treants to join him. Gerald conjured a blade barrier to deal with animated trees, as Dacien blocked with retreat with a wall of force and Zhedd's summoned fire elementals hemmed them in. Mendel tried to attack the gakarak with his alchemical arrows, and Faldak used his potion of invisibility to catch it by surprise. The dwarven woodchipper launched into action, and in moments, all that was left was a cloud of splinters. Antony scouted ahead through the enclosed garden, and spotted two humanoid figures atop the strange stone walls, moving in a strangely unnatural motion, and periodically bending down to examine the top of the wall. They hadn't seemed to spot him, so he pressed on. A drawbridge led from the garden into the main courtyard around the frog-shaped building. In the gateway, a red dome shaped object was on the inner wall, surrounded by a yellow and black striped panel. Antony snuck forward, and saw a set of large double doors between the frog's legs,with the a circular symbol above the doors depicting a frog in a helmet jumping on a starry background. Strange writing in an alphabet no-one recognised circled the emblem. The doors were ajar, and it was dark beyond. Somewhere in the dark a light was flickering, and an animal grunting could be heard. Antony beckoned the party forward, and the noise alerted the humanoids on the walls. A burst of flame erupted from their back, and they leapt into the air to land in the courtyard ahead of the party. They spoke a strange language, but Dacien's tongues let him translate their odd way of speaking. He caught phrases such as "Target acquired", "New species identified, engaging containment protocol". The figures looked like humans, but with strange metal plates embedded in their skin, and an unnatural look about them. They lit up Faldak with a red light, and a tube appeared on one's shoulder. Mendel fired an arrow at that creature, and the response was "Attack protocol engaged, prioritising targets". A force field erupted around Faldak and tried to encage him, but he escaped. The other creature drew a strange dark rectangular weapon and fired it at Mendel, searing him with arcs of burning light. The attacks nearly brought Mendel to his knees, before Dacien warded him against fire damage. Faldak almost destroyed one of the creatures, but heard it call out "Critical damage - ejecting core! ", and it exploded around him. The other was defeated but did not exploded. One the bodies, the party found various unusual objects. Mendel managed to get the weapon to fire after some experimentation, but put it away for now. A buzzing noise above their heads drew the party's attention upwards. In the mouth of the frog, was a swarm of strange small winged lizards, buzzing about a trough of rotting meat which sat before a set of doors. 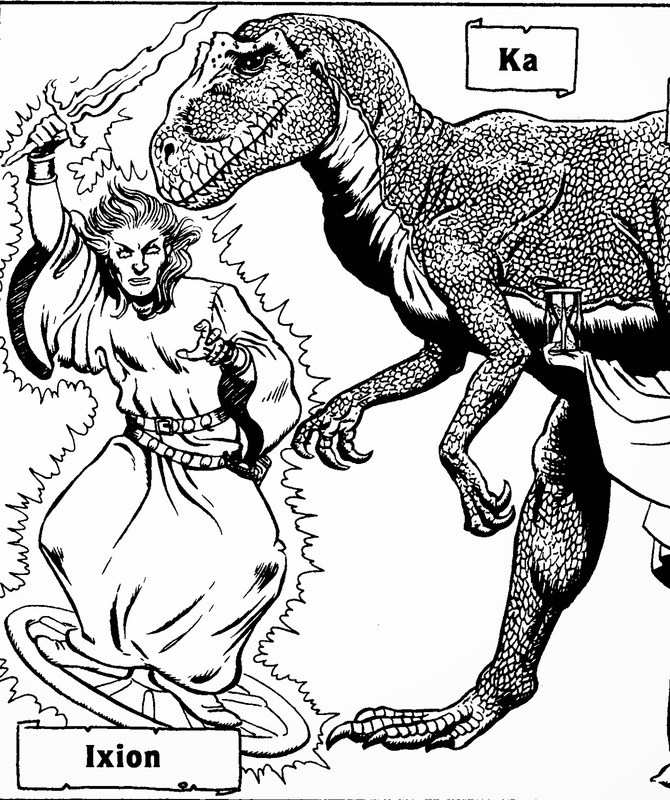 Magical explosions and ice took care of the lizards, allowing the party to explore the doors. One was full of mangled bits of metal, which appeared to form a set of shelving, and hid a metal box which held bandages and alchemical type items. The other doors led deeper into the building. There the party found strange doors that were either jammed or flung open at their approach, and beyond were abandoned, well-appointed washrooms and bedrooms. Most of the rooms looks as though the portable contents had been removed in a hurry, although Dacien did find a book that Antony thought might be a diary - again, written in this new script. A further room held a series of metal cabinets, which made whirring noises and flashed their gem-like lights upon the party's approach. This had a strange effect on Antony and Faldak, who attacked the party until Dacien and Zhedd could ward them with a protection from evil. Mendel attached the largest cabinet in the room, and was struck by a bolt of electricity that somehow ran around him and flew into a door opposite revealing another room beyond. Concerned about the powers of the strange metal cabinets, Dacien used telekinesis to block the doorway with large wardrobes, which allowed the party to explore the other rooms beyond. Antony snuck ahead into a large room with a balcony filled with pews that looked down on a frog shaped altar - bound on top of the altar was the body of a humanoid figure, held down with ropes. Another room held a large white metal silo, covered in dents and with a yellow and black triangle painted on its side. Another metal cabinet was in this room, but smashed, and Mendel spotted traces of blood spattered around its base. White robes with blue brooches were hung on the walls - a white pattern on the brooches turned black on entering the room. 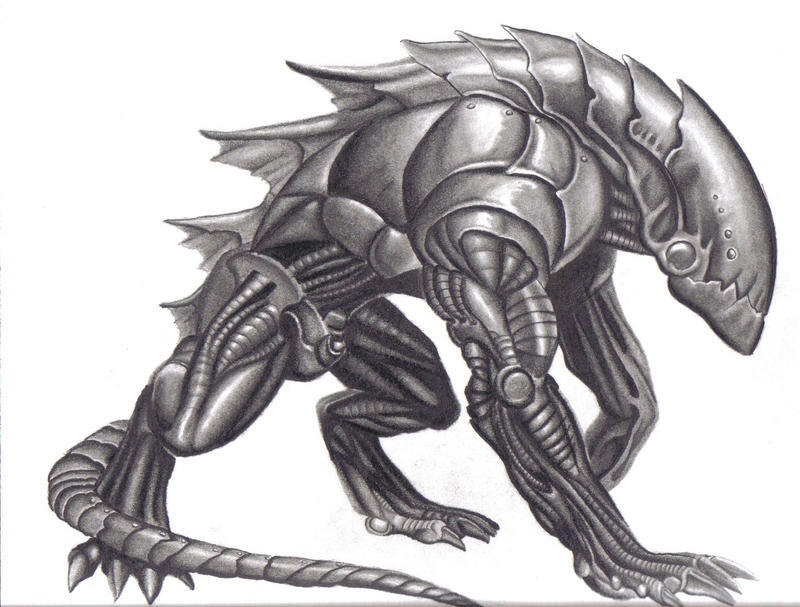 The party found some stairs leading up and there came across a large room with a hexagonal vat hidden under tarpaulin, guarded by two metal dog-like creatures that Dacien thought similar to extraplanar sentries that can rend armour and weapons with ease. Leaving that room alone, they followed some stairs leading up to the head of the frog - the room was caked in shadows despite the afternoon light filtering through the red faceted eyes. 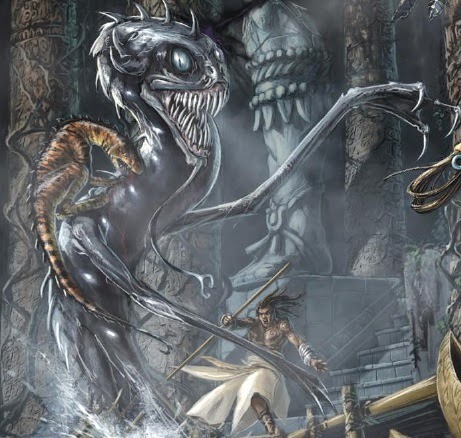 Two hovering metal creatures emerged form the shadows to attack the party, seemingly near invulnerable to most attacks until the party used light spells and the sun blade they recovered from the Isle of Dread to hold them back, after Dacien had sent one to the Plane of Shadow. As the last automaton fell, a pale human figure emerged from a chamber in the centre of the room, looking at the party with tired red eyes. As it spoke, two pointed teeth protruded over its bottom lip - clutching a device at its neck it said "Please leave". Dacien took the party back to the ship, where Captain Nosmo Beldan greeted them officiously. There was some discussion of visiting the tortles to explain recent events, but when Nosmo explained the winds would take them quickest round the western side of the island back to Farshore, this was soon forgotten. Back in Farshore, Lavinia listened with interest to the reports, and was grateful to have her 'tribute' to the dragon turtle returned - rewarding them all for their efforts. When talk turned to future plans, she left them to it, but not before a brief discussio nabout taking trade goods back to Sasserine to try and spark interest in the trading port. Mendel did talk with Manthalay about less above-board trade, which Manthalay seemed to agree with Lavinia was not to be the focus, although he did leave Mendel with some samples of an exotic fruit that he suggested not be handled without gloves. The party set off for Sasserine, and spent much of the next few days shopping. Aloysius had returned from his travels with a substantial return, part of which was reinvested in the tailors shopfront in Shadowshore. Zhedd took some time to visit the Witchwardens, and look for additional items to go with the gloves he had commissioned from them.When he realised he didn't quite have the money for all the items, he asked for a 'loan' to cover the goods. Dark Priestess Teranaki was open to the offer - on the condition that Zhedd would partake in a mission for them. At the next full moon, undead would walk around the ruins of Chekitewhan, and adventuring parties would often interfere with the rituals; the Witchwardens wanted someone to stop the adventurers from doing so. When Zhedd complained he couldn't think of a way to achieve this, and a lack of willingness to help the organisation, Annah Teranaki grew angry at his lack of effort and imagination to aid the Witchwardens, and sent him away. The party set about collecting their goods, and planning the next stage of their adventure. Mendel had convinced the others to investigate the trade disruption in Emerond, so they first went to the Temple of Asterius and spoke with Lirali Woarali again. She explained that all caravans had been barred from entering Emerond recently, and exports of their prized alcoholic spirit had ceased. They were a secretive nation generally, but friendly and peaceful so this was unexpected. She described the Emerondians as similar in appearance to elves, but with a greenish tint to their skin, and living in strange cities that were grown within and form the forest trees themselves. Lirali put the party in touch with a caravaneer that was in the capital at the time the borders were closed. He had been trading metal goods with them, as it it something they did not generate themselves. He told a tale of the Emerondians being spooked by a comet falling from the sky, and parts of their plant-kingdom withering and collapsing. Antony asked around and also heard tales of some pale-skinned elves accompanied by a dark haired human with a goatee asking questions about Emerond - the party described Bargle form the wanted posters, and surmised this was he in the company of some shadow elves. Zhedd led the party to a small shrine to Ordana in the Sunrise district - there had been whispers that the Emerondians were followers of Mother Forest. However, the elven priestess they spoke to dismissed this idea - she claimed that whilst the Emerondians lived as one with the forest, it wasn't wholly natural; trees were grown out of proportion and beyond which they should be able to sustain themselves. She saw no sign of Ordana worship in their practices. Mendel gave her a donation for her time, and she clearly was surprised and unsure what to do with the money. They then bought horses and set out to the south, aiming to make the border to the kingdom by nightfall. They rode past the plantations that surrounded Sasserine, and skirted the mountains to the east. The land broke into boggy swamp, where the rain run off from the mountains had collected, and thick verdant jungle, with the southerly caravan route dividing the two. 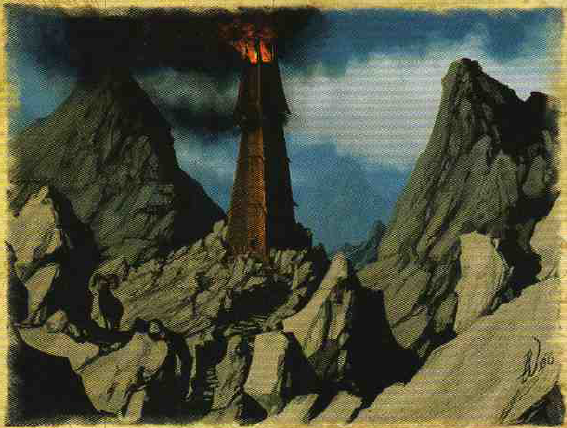 In the distance, a rusted chimney bellowed smoke and flame above the mountains to the west, and a dark obsidian stone tower rose above the jungle to the east - the party guessed this was Chekitewhan. Zhedd, flying on Banshee above the party, dropped to meet the others when he and Faldak heard a strange voice in the trees. It was a manic, alien tongue that neither recognized. As Zhedd flew up to investigate, dark beams of energy flew out form the trees and struck Banshee. A pair of Beholders were in the canopy of the forest, and turned their antimagic eyes on the path. Mendel and Gerald tried to make blind shots with bows and magic in their direction, as Dacien froze the air in front of them. Faldak and Ji charged into the fray. In a moment of premptive karma, Ji fell foul to the disintegrate ray of one of the creatures. Faldak was charmed, but the rest of the party managed to kill the bests before anything further happened. Looking at the jungle from above, and the scarred bodies of the beholders, it appeared as though they had been squabbling and fighting each other - Dacien confirmed it was unusual to find them in this terrain, and their insanity meant they practically never worked in teams unless a Hive Mother guided their actions. Finding no sign of how they got here, the party set up camp and continued in the morning. Come dawn, Zhedd spotted the kingdom of Emerond a few miles to the south. it's border was plain to see - a ring of trees that were taller, lusher and a more vivid green than the surrounding jungle. The border traced a perfect arc, from what Zhedd could see. After a brief ride, the party came across a guard post on the trail - three of the green skinned folk standing with halberd drawn to block the path. Their weapons and armour were made from wood and hardened leaves. Behind them, a large snake sunned itself on a tree branch and a pair of giant flies waited with wickedly sharp forelimbs and saddles on their backs. The guards commanded the party to stop, but in discussion, when they heard the name Bargle and shadow elves mentioned along with an offer of help, they agreed to report back to the capital and see if they could be admitted. Eventually they were, and met by the High Councillor in the capital, who informed them King Jerem Rhody would meet with them in the baths presently. - a comet was seen falling from the sky and landing in the centre of the kingdom. King Rhody alluded to the fact that his people were not originally of this planet, and it may be that safeguards that were put in place to prevent his team interacting with natives could have been enacted. If the party were willing to investigate the problem, the King would offer what he could in return. Only a small cadre of close advisers still knew the ways of technology, and he feared sending them would cause too much fear in the city at their disappearance, but they could be called upon at the right time if others were needed to solve the problem. He agreed to trade, special goods, and education as a reward, on the condition that the party not return for fear of spreading to much knowledge of the origins of his people amongst his subjects. The party agreed and enjoyed the rest of their bath, Antony feeling quite light headed by the end. 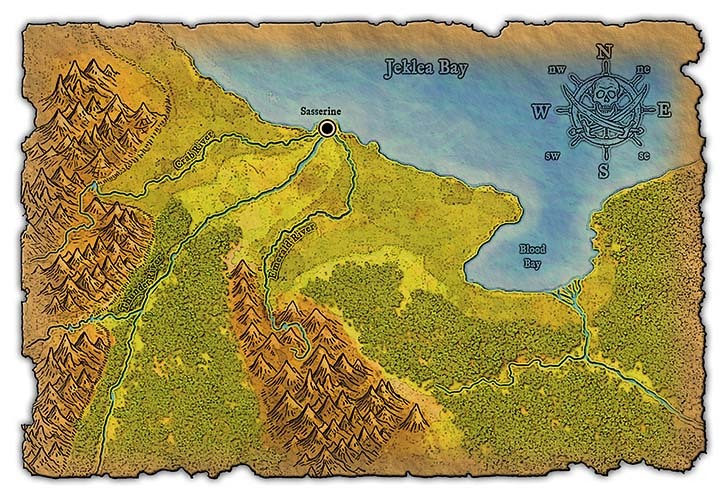 The following day, the party ventured beyond the tick wall of vegetation that hid the centre of the kingdom, and were given two canoes to navigate the mangrove swamps that lay beyond. They had barely left the Emerondians for 20 minutes before and dry booming voice rang out form ahead in Sylvan. "Leave my trees alone! Leave this place!" Zhedd replied that they were determined to press on through, and the trees, which had seemed to flinch at the party's presence, began to uproot and move closer. The party stood on the deck of the leaking ship in the still waters of the cove. The northern coastline of the Isle of Dread was visible in the distance to the south, but spoiling the view was the belly-up bloated body of a dragon turtle. Mendel set about examining the ship for damage, and found as intact as could be expected for a wreck that had spent much of the last few months torn open and beached on a reef. Zhedd asked his crocodiles to examine the body of the turtle for treasures, and finding none, then sent them into the waters below to look for any dropped rings or jewellery. A few moments after disappearing beneath the waves, some thrashing and and blood appeared in the water under the ship. A few moments later, Mendel noticed the water levels in the bilges rising, and all on deck felt the ship lurch to port. Gerald and Faldak went to help deal with repairs, whilst the others on deck kept an eye on the water below. Antony spotted a tortle swimming in the sea off the port bow and being casting a spell. Antony and Ji were caught by surprise when a woolly mammoth appeared on deck in their midst. The ship lurched suddenly as the beast wrapped its trunk around the main mast and tried to keep balance. Antony tried to keep out of its way and watch the tortle, as Ji used oil to unbalance the beast, and send it slipping off the side. The ship was almost pulled to its side, and below deck, Mendel and Faldak saw signs of a tortle boarding party ripping apart the warped planks at the keel. Dacien set about leading the offensive above decks, once Antony had held the tortle druid, by using a wall of force to make a bridge from the sinking ship to the corpse of the dragon turtle. The party made a retreat from the ship, leaving Faldak as honorary captain to do the noble thing. 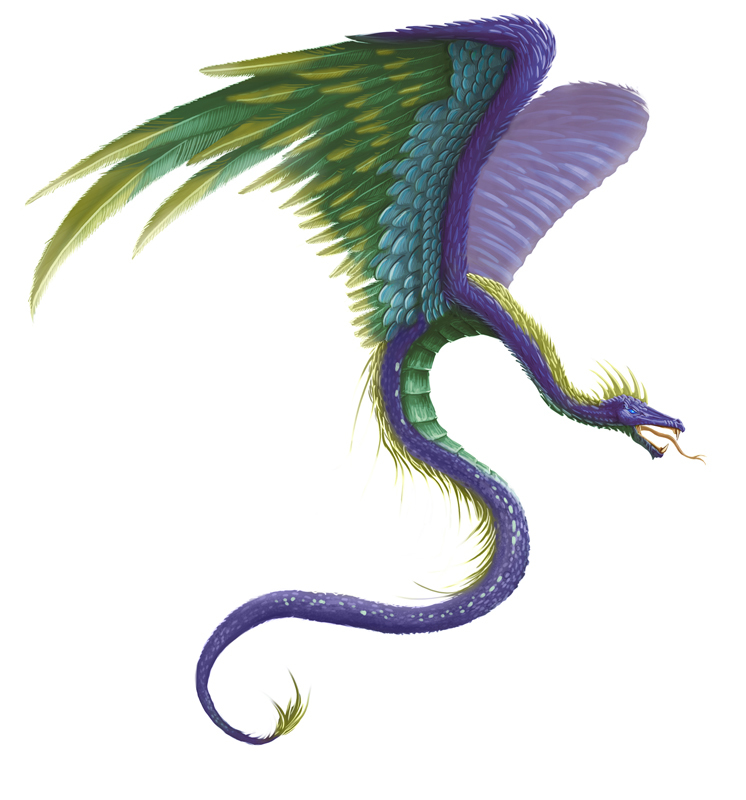 Ji was caught by a spell as he leapt from the ship, and polymorphed into a pteranadon. Dacien caught the tortle in a resilient sphere to give them some breathing space, and prepare themselves. Faldak finished off the tortle boarding party, and joined the others. Dacien and Zhedd were the only ones able to tackle the tortle without entering the water themselves, and eventually finished him off, but not before many of Zhedd's metal items had been transmuted into wood. With the ship on its side and sinking, the party used water walking to make their way to shore, and then up onto the cliffs. Zhedd communed to identify the location of the dragon turtle's lair, which lay 6 miles to the south. But as the party started their trek, Faldak spotted signs of a roc, nesting on the side of the cliff. A little drained from the earlier battles, the party decided to retreat to Farshore. They dined with Lavinia that night, and planned their expedition to the turtle lair. Knowing they were facing coral golems, and neither Zhedd nor Dacien recalling much about them, the party decided to visit Sasserine and ask for help of the libraries. Zhedd visited the Witchwardens, whilst Antony and Dacien went to Blenak's Bazaar, the home of a noted sage. Zhedd's research took long in part due to an elderly gnome not being the quickest bout his work, but was asked to meet with Her Dark Priestess Teranaki, head of the guild. She praised Zhedd again on his work bringing them the zombie from the Isle of Dread, and claimed to have learnt much already from its construction. Also, a local artifact of Nyx had been recovered. She asked Zhedd to look out for other specimens of unusual undead, and refrain from attacking intelligent undead if possible - using the Witchwarden's name if it would help broker a peaceful encounter. She also mentioned that they could use some help with the up coming full moon in guarding the undead at Chekitewhan, a local vault, where local 'do-gooder' adventurers would attack the undead guardians that the Witchwardens wanted to protect. Finally, as an enticement to make Zhedd a more proactive member of the Witchwardens, she asked about his retraining to become a necromancer. Dacien and Antony has a less unnerving meeting, and afterwards they pooled their knowledge about weaknesses of the golems. Armed with this knowledge, the party made their way to the lair, navigated their way past a wall of dispel magic, and set about ransacking its loot. The two coral golems were contained by some careful tactics and preparation, and quickly dispatched. This left the party to recover the crates and chests of treasure the dragon turtle had collected over many years. As the rest of the party disappeared with Dacien's teleport, Zhedd and Banshee were left behind with two mocking baboon faces leering hungrily at them both. Zhedd quickly dimension door'd the pair of them upwards and out over the lake on the surface. Using illusions, Zhedd kept the two of them hidden as he sought out a refuge to hide and await contact from the others. He found a crevasse on the sheer cliffs that surrounded the plateau, and created a ledge to rest upon. Having rested and memorised new spells, Zhedd communed to get a feel for the creatures that lived nearby, and identified a powerful unnatural creature living in the lake on the plateau, and the treant he'd met earlier currently somewhere in the forest to the south. Zhedd searched the forest for some time, luckily avoiding any encounters, until he found signs of the treant's passage. The treant recognised Zhedd, and agreed that the druid could accompany him to a meet with his grafted partner for safety. In return, the treant explained he was distraught at the 'two-legged civilisation' that had come to the plateau and cut down trees to build structures, and exacted a promise from Zhedd that the druid would destroy any further spread of this 'civilisation'. In the meantime, Zhedd found a pool and, after failing to contact Dacien, managed to scry Mendel and pass on the message about where he was hiding. Dacien came up with a plan to retrieve Zhedd, and after a series of teleports the party were reunited in Farshore. The party had filled Lavinia in on what had occurred and looked to return to Sasserine to get supplies. Getting an update on events in the settlement, it appeared that Manthalay Meravanchi had started an operation to source criminals from the natives and ship them back as slaves, to keep a trade ticking over for the growing operation. 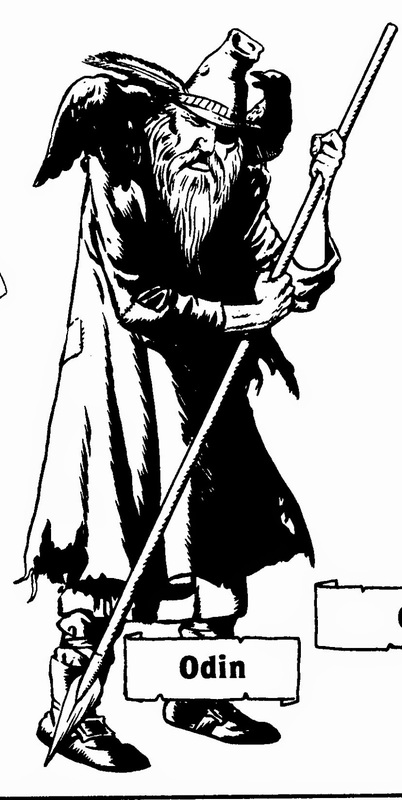 Lavinina also introduced the party to two phanaton that were seekign adventure with the party in return for passage away from the Isle of Dread - Gerald, a reincarnated dwarf, and his companion Lenny. Three new ships were in harbour - one of Karameikan origin, looking to resupply on the voyage south, a ship of Vanyan pilgrims heading south, and the other a strange ship of dried aged wood with rigging and sails made from webbing. Of the latter, there had been no sign of activity on the ship, save for a pteranodon which had been caught in a spider-web bag on the central mast, and was fluttering listlessly. The Karameikan ship Ekaterina was strange for not docking at one of the jettys and remaining further out in the harbour - also, all windows were blacked out. The crew had made little contact save for the first mate Ivan Ivanov who was overseeing supplies. None of the crew had been ashore for leave. Mendel spied on the ship from one of the clifftops and saw a pale figure hiding in the shadows. When Ji and Faldak escorted the supplies to the ship, there as resistance to let them board, but Ji persisted, drawn by the smell of stale sweat, and also spotted the strange figure. Slipping the first mate some coin, Ivanov let slip that he was carrying a cargo of strange albino humanoids he'd picked up from the caves to the north, at the behest of some shadow elves form the nation of Aengmor. Mendel spoke to the head of the Vanya missionaries, Heinrich, who spent most of their time in weapons training by the docks. They were headed to Raven's Scarp on the southern continent of Davania as part of a pilgrimage to a place called Vanya's Rest. They suggested approaching Steefanie's mercenary contingent for burial rites, but felt that the death in battle against a major foe would suffice. The webbed ship caused more interest, and the part approached it. Strange metal plates adorned it surface, and after hailing the ship, something from within tapped on the metal sheets. After contact was made, a group of large dark spiders emerged on deck and spoke in piping voices. The leader introduced himself as AckAck, of a race of planar spiders known as Chak that called the Astral plane home. They often travelled as merchants, picking up exotic wares and information to trade. 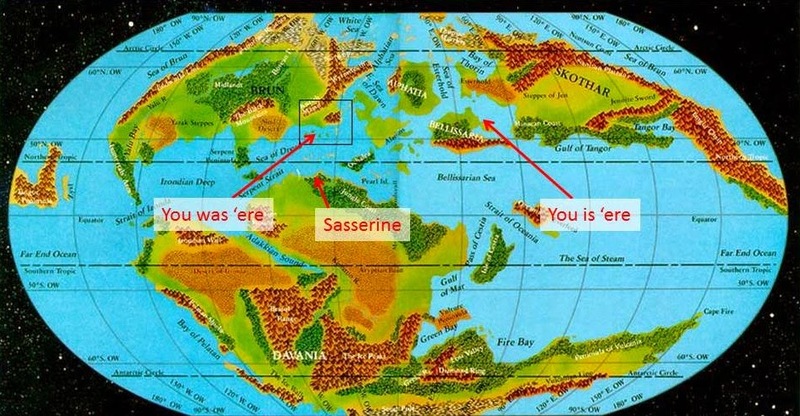 They explained that they had been drawn here following ships from the Material Plane that were sailing on other planar seas, and they were curious who and how. The ships carried flags of a skull over crossed swords on a red background - the same flag the party had seen carried by the Sea Reavers of the Crimson Fleet. After exchanging tales, and signal books, the party were able to trade with the Chak and get the supplies they needed. The party continued to explore the 'taboo' island. Skirting around the eastern side before heading towards the cliffs, they encountered more skinwalkers, who had prepared an ambush. Faldak caused the undergrowth to entangle them as Antony's snuck by, and the party soon managed to turn the tables. T othe sourtheast they found another ziggurat - this one collapsed and inhabited by spectres. Antony, who had reluctanly clambered down into the ruin in the first place, bore the brunt of their attacks until Stefanie called upon Vanya to hold them t bay whilst the others sent them back to their graves. This ziggurat bore the markings of the immortal Khoronus, and it appeared the others were also dedicated to members of the Council of Intrusion; matching the deities they had seen on the artifact in the aboleth city deep below them. Finally the party made their way to the cliffs where they had seen a large entrance previously on the shorefront. Another ziggarat rested here, inscribed wit hthe sigils of all the council's immortals, and just beyond they heard the shouts of a skinwalker (strange as they had seen these creatures use telepathy earlier), answered by another muffled voice in the same tongue. ANthony scouted ahead and saw a cluster of huts with a lone skinwalker on guard duty. Under a greater invisibility spell, he left the rest of the party hidden by the ziggurat and snuck forward with Faldak and Mendel to launch an attack. Antony used a wand of fireballs to sow confusion as Mendel sniped at the skinwalker guard and his companions emerged from the huts. A powerful skinwalker spellcaster emerged and Faldak was the unfortunate victim of a feeblemind spell, taking him out fo the fight as suddenly the soil become far more interesting. Seeing the flames, the rest of the party rushed to join in the battle, but Zhedd too was feebleminded. Antony continued to spray fireballs around - even launching on inside a hut from where he'd heard voices before. Mendel was suprised a a red-headed halfling appeared behind him and planted two arrows in his neck - but his return volley gravely injured the halfling and caused him to surrender. Soon, the skinwalkers were defeated, and the party gathered round their two feebleminded companions and the strange new halfling guest - whose skin bore the same ruddy tone they had seen on the Crimson Fleet pirates. He introduced himself as Throgiff, a member of the Crimson Fleet from a land he called Cimmaron. He was apparently exiled here after embarrassing his captain Longshanks LeShiv in a game of cards; left on the island to oversee the slaves that were sent here, and the delivery of the shadow pearls from the skinwalkers to the korpu, via a tunnel hidden at the ziggurat's peak. He was completely disillusioned with his lot, and his only interest was to get off the island and escape back home. He said he had a ledger monitoring the number of slaves sacrificed and shadow pearls delivered to the Crimson Fleet's base in Scuttlecove; but the ledger had been destroyed when Antony fireballed the hut in which he was staying. The leader of the fleet, Cold Captain Wyther, kept in touch with Throgiff via a crystal ball with telepathy, but had not been in touch for a week or so; and Throgiff had no knowledge that Vanthus had died. 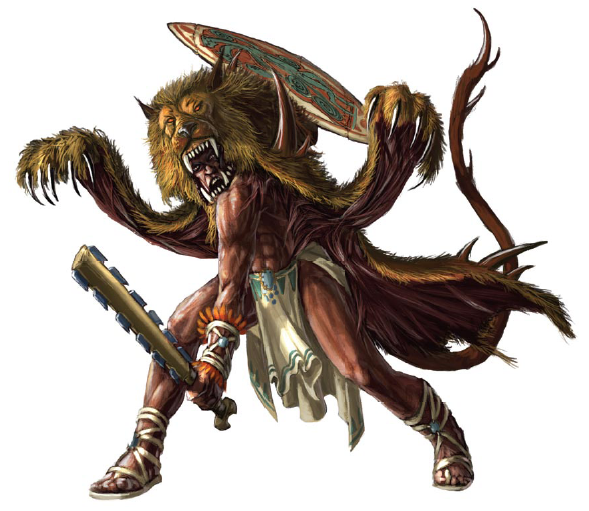 After some debate, the party agreed that Throgiff could accompany them if he helped them confront the skinwalkers in their base. He agreed; but had not been inside their lair. Still, he happily showed them the secret entrance they used, hidden in an alcove to the north of a large set of broken double doors built into the cliff face. The party rested, and the next day entered the structure carved into the cliff. It appeared an ancient but well built structure, and showed signs of a lot of use by the skinwalkers. The secret door led to long corridor that ended in another secret door, which was easily located and opened. Beyond was a small chamber with a carving of a ziggurat on a pedestal in its centre. An inscription in abyssal, which Throgiff translated, read "The blood keeps safe the flesh", and indeed there were signs of dried blood in channels around the surface of the carving. The warning became clear as the party headed south, and triggered a trap which sent a giant boulder rolling down the corridor towards them. Zhedd quickly shaped a stone lip across the corridor behidn them, and Dacien created a wall of force to divert the boulder safely to the side. At the end of the corridor they found a chamber with an altar soaked in blood, much of which was pooled around the southern wall; searching here, Antony found a secret door which opened to some stairs leading down into a waterlogged passage. Ignoring that for now, the party continued east, and saw the rear of the broken double door in the distance. Before they coudl aprpaoch, they were overcome by an awful stench of rotting meat and decay; as a giant flesh jelly emerged from its lair at the sound of approaching meat. 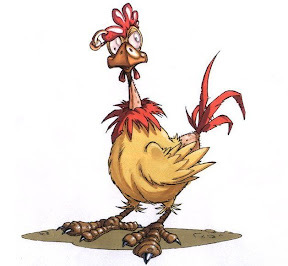 This oozed from its pit towards the party, the stench becoming unbearable so that ll but Fladak's strong stomach emptied. They fled, a hastespell adding speed to their staggering, and launched fireballs from affar as the corridor filled with flesh behind them. The session ended as Zhedd appeared behind it and his last fireball blew it to pieces; spattering the rest of the party in gore.